Good morning and happy Friday friends. I know I said from the beginning I'd share the nursery progress with you and I am excited to announce that we are really close to being done! We've been putting off hanging a few items but hope we can get that done soon. Below are just a few Instagram pictures I posted last week. My favorite part of his room is the gallery wall over the white dresser/changing table. 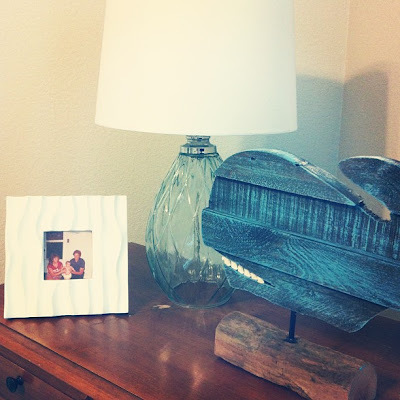 I've loved collecting things and crafting and am still on the hunt for a few more items! I made the curtains myself (fabric here) and hope to bring you a tutorial on the chicken wire frames soon. There are actually 2 of them hanging on the wall but I need some stuff to clip on them. The picture in the frame is Jon and his parents when he is only a few months old. It is a really special picture because his parents got divorced before he was 1 year old and this is the only picture we have of the 3 of them together (Jon's dad passed away 4 years ago so we love having his picture up). I ordered this rug from Target and it should be delivered today. Not sure if it will be the right size or color but I wanted to add some more yellow to the room and since it's a large room, the middle of it looked really empty. I highly recommend getting the Target credit card because you get 5% all purchases and free shipping online! There are so many products they offer online that aren't sold in stores. Next week I am picking up a pouf/ottoman handmade by Caroline (she made us 2 for our family room and we love them!) and the rest of his bedding and pillows should be done soon. My baby shower is in 2 weeks and I can hardly wait! I am still in utter surprise and shock that my office threw me a surprise baby shower yesterday afternoon. And I am never surprised! Baby Hart cleaned up, I am so humbled by how many people love our son already. One of the gifts I got was our infant carseat so we can officially bring him home. They also gave us our video monitor, pack and play, and TONS of other gifts!! I can't wait to start setting things up! 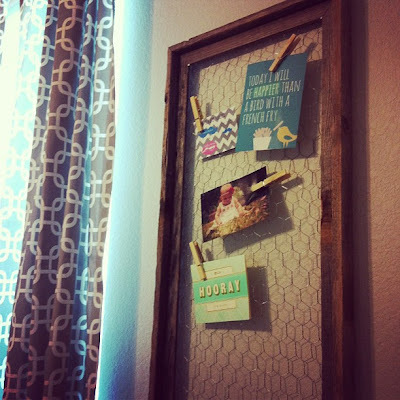 This weekend Jon and I have our hospital tour, finishing some stuff up in the baby room (we want to make something with reclaimed wood for over the crib similar to our headboard), and then we are heading to San Antonio for a getaway. Hope you have an awesome and restful holiday weekend! Lil baby Hart is going to have the most stylish room!! Love.his.room!!! Y'all are so creative and "artsy" (for lack of a better word, ha). Can't wait to see the finished and final product! Have a wonderful weekend and enjoy your getaway in SA! It seriously looks awesome Ruthie! Girl, you have style! Y'all have fun in SA this weekend!!! baby hart's room is coming together so well! I absolutely adore the gallery wall and TJ Maxx is really rocking with all the whale stuff! Hope y'all have a ball in SA, I went for a conference the summer before last and LOVED the river walk area! Looking good!! Have a great time on your little getaway to San Antonio! Its looking great! And awesome about the surprise baby shower, sounds like you really got lots of necessities. It looks so amazing!! Wow you did a great Job!! I love it! It's all coming together so nicely! LOVE his room! I love when nurseries have decor that can grow with the baby. It is so perfect! Looking soooo cute!!! And all the artsy touches you can make and add yourself are so special! :) Can't wait to see you little man IN his room!!! I love his little room! So cute! looks great! you are so crafty. i am jealous! baby hart is going to have a great room! 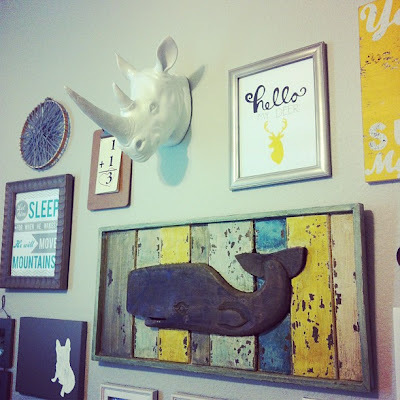 our nursery is nautical and i am SO jealous over your whale finds!!! i love love love them. If he won't sleep there I will. Seriously such a cute nursery!! I LOVE IT!! You are soooo super crafty and talented! That was one of my favorite parts of being pregnant - seeing how much love OTHERS had for our baby. So incredible :) Glad everything is going well - you are almost there!! 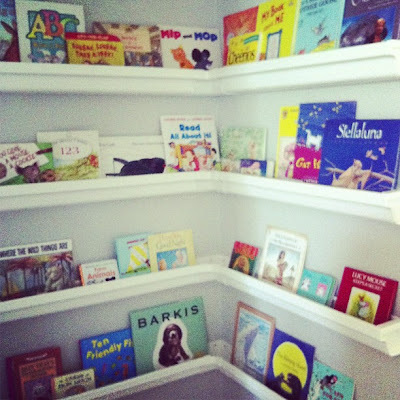 Such a wonderful room...Baby Hart will know how much he is loved by his parents just from that room! I love all the touches...I wish I had an ounce of your talent! Looks AMAZING!! !love the gallery wall! !